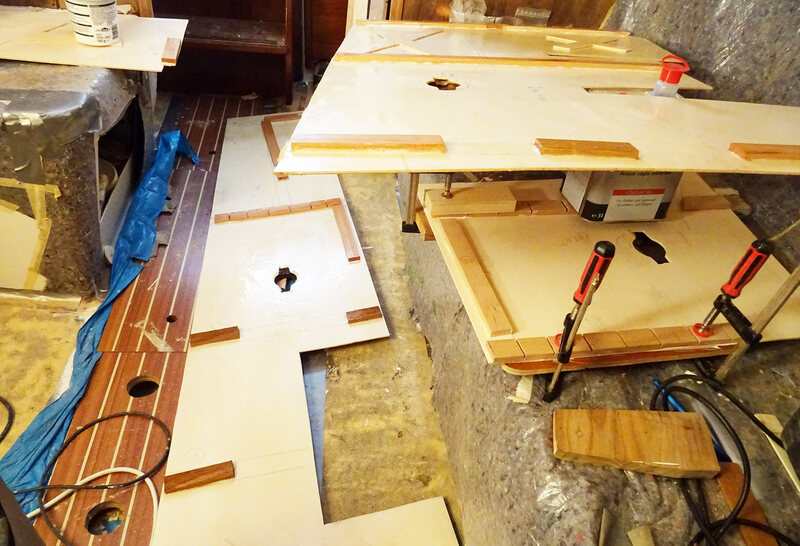 Sailing Yacht Refit: Roofing Panels. Part 2. 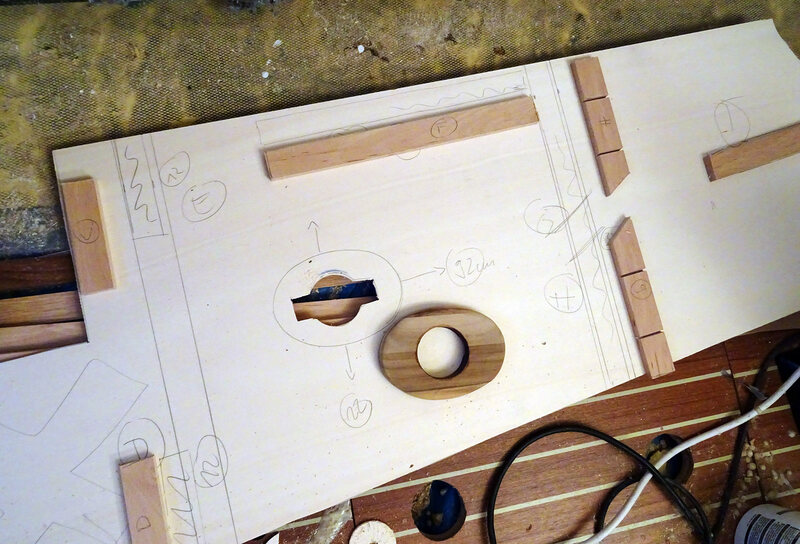 As you may have been reading recently in Part 1 of this series of making new roofing panels for my sailing yacht, I was first preparing gauge models made of cardboard-stripes to get the exact measurements and squares for each of the roofing panels. This was a bit tricky since working overhead is tiring and gravity working against oneself. Nevertheless, in the end the first 4 gauge models for the port side and mid-section panels looked promising. Here´s Part 2 of how to make new roofing panels. First task was to transfer the measurements of the gauge models onto the birch tree plywood sheets. This is a no-brainer of course since you just have to get a pencil, fix the model on the sheet and simply draw lines all along the outer edge of the gauge model. Later on, after removal of the gauge model, I was retracing the lines with a large ruler to achieve straight edges and tried to make rounded edges more smooth with dividers. The outcome is a one-on-one copy of the gauge model. Now it´s time to cut out the new panels. But beware: That´s a tricky one though. Will it pass through the narrow entryway? Well, at least if you go for the thin 4 millimetre plywood sheets as I did. 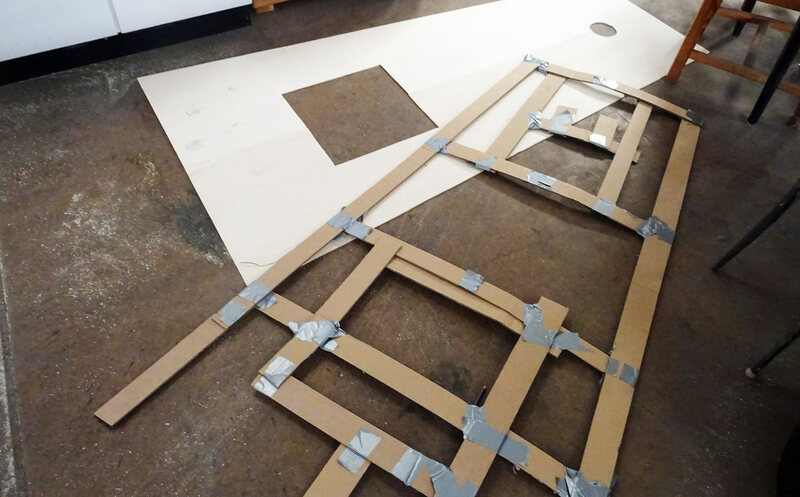 Because of the huge measurements of the panels and the weight the panels will crack and finally break with ease if not carried and transported properly. Watch out not to destroy your work in a blink of an eye! 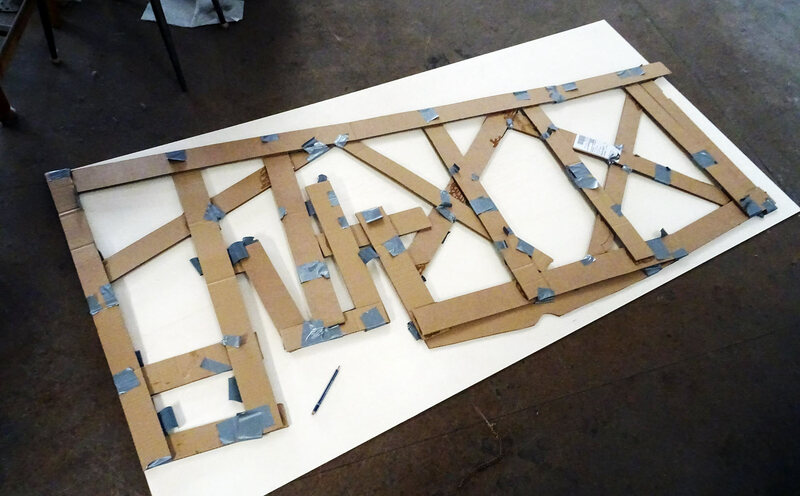 Another learning here was that I may be able to fabricate large panels – but I cannot make the entryway to the boat larger. That one for example forced me to cut the one-piece large roofing panel for the mid-section into two. Having cut out the panels, sanded the edges smoothly and got them into the boat I fitted each panel to the ceiling. That´s also tricky since the sheer vastness of the panels will force you to work with stamps to keep them in place. Here´s also an innate danger of breaking. Sometimes I had to cut away millimetres of plywood in order to fit the roofing nicely. Now, how to get the panels to the ceiling? I opted for screws and washers which will later (hopefully) covered by decorative Teak stringers. In order to do so, these screws will have to be placed exactly along straight lines and drawn into the Oak-substruction made prior to this step. So, by fitting the panels, I was making marks with a pencil where the substruction stringers would run behind the panels and transferred their position onto the panels. As you my see on the picture above, there are stringers (also made of Oak) which are positioned intermitted. This is where later on the cable ducts for the wiring of the LED-lights will be running through. I also cut out holes for the Teak made light plinths as well which are to be glued to the panel from the other side in a later step. It truly is a rather complex thing to do as you will always have to think and work mirror-inverted and it´s advisable to have the wiring plan of the boat pinned somewhere near your working area: If you make a mistake here and forget a wire, it will be tedious work to get off the panels and rework it. 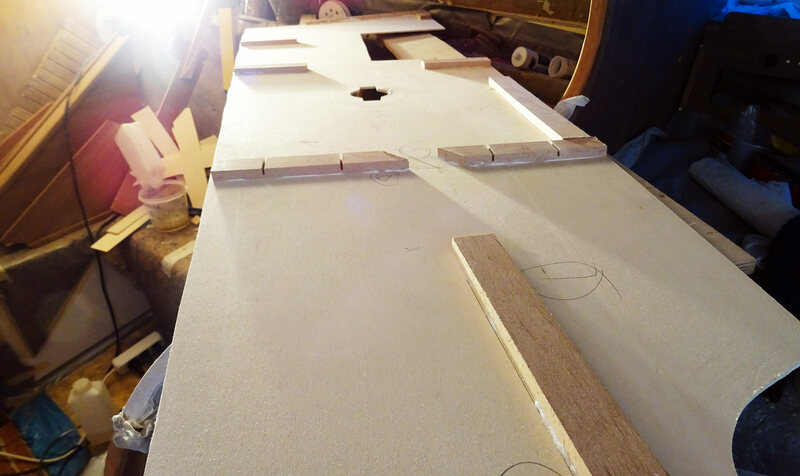 The Oak stringers will then be glued to the panels by means of a simple D4-glue and applied pressure. A bit more challenging is the application of the panels to the midship-section as these panels must be bent in order to fit. This in mind I was opting for a 4 mm thick plywood sheet instead of thicker material to ensure bending. Where the panel will have to follow the concave form of the ceiling I simple cut out slots of some 3 mm width every 5 or so centimetres from the stringer. 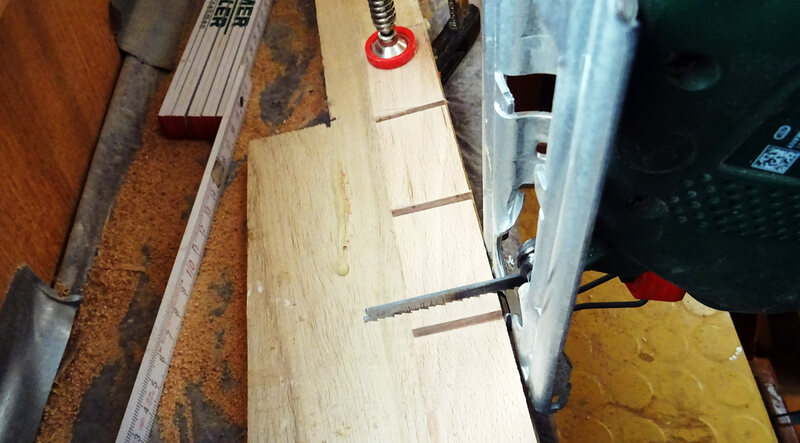 Cutting all down through the stringer and trying to let some 2 mm intact – this will make the stringer both bendable yet keeping it strong to fulfil its task. When I was removing the old wooden parts of my boat right after I acquired it (read about these 90 working hours here) I noticed that a lot of the panels and especially the roofing panels had been severely damaged by water: Black mildew grew nearly everywhere, the timber swollen by water. No wonder: The backsides of them panels hadn´t been treated appropriately. The finished raw port side midship panel. Note the opening for the wiring in the stringer. 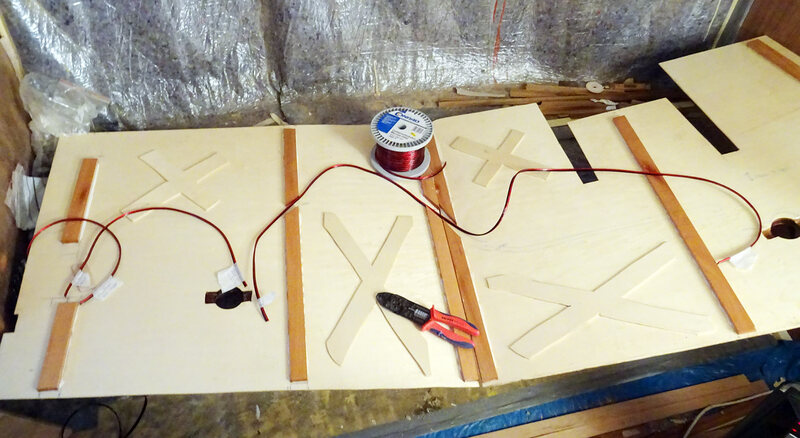 So in the first place I want to make the panel – soft plywood! – waterproof. The best way to do it in my mind is a thick layer of Epoxy resin. It will be sucked in and absorbed by the material, especially the vulnerable edges where moisture can enter the easiest way. Remember: There will always be condensed water between ceiling and panels, drops of it coming down on the material. It´s really worth to protect it. A welcome side effect of the Epoxy priming will be a surplus bonding between the stringers and the panel. By priming I also glued the LED-plinths to the decorative sides of the panels, fixed them and ensured they will be perfectly aligned all along the wood grain. Two sessions later I did had either sides of the panels waterproofed with the first layer of protection. Let´s go for the wiring. 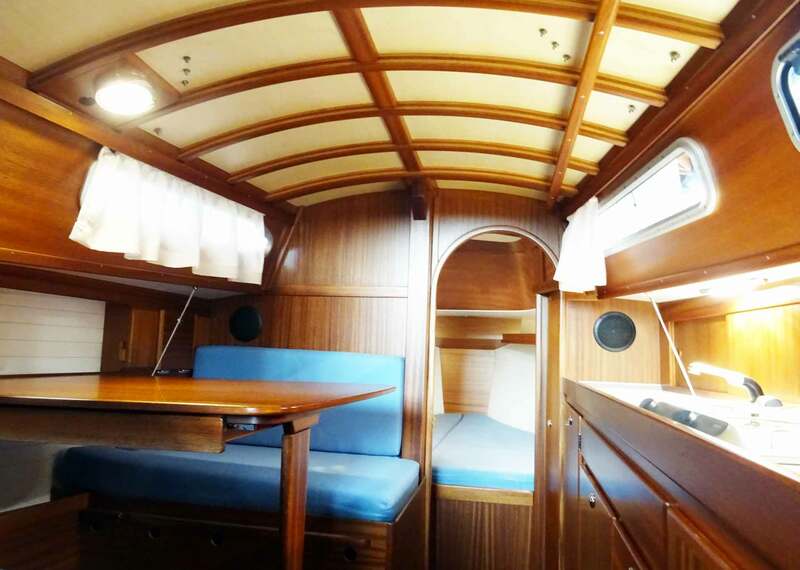 As you may have read in one of the previous articles, I am going to re-wire the whole boat, especially the LED-lights and the nav-lights coming down below from the mast and the outside of the yacht. Therefore I need to have new wiring cut to size and somehow fixed to the panels. As there will be constant movement within the boat, I don´t want the cables to just lay on the panels as chafing puts a threat to both insulation (and later on possible short-wiring) and the connections. So how to fix it? After cutting the wires, marking them with labels and fixing them in place I really spent some time thinking of the best way to get them fixed to the roofing panels. 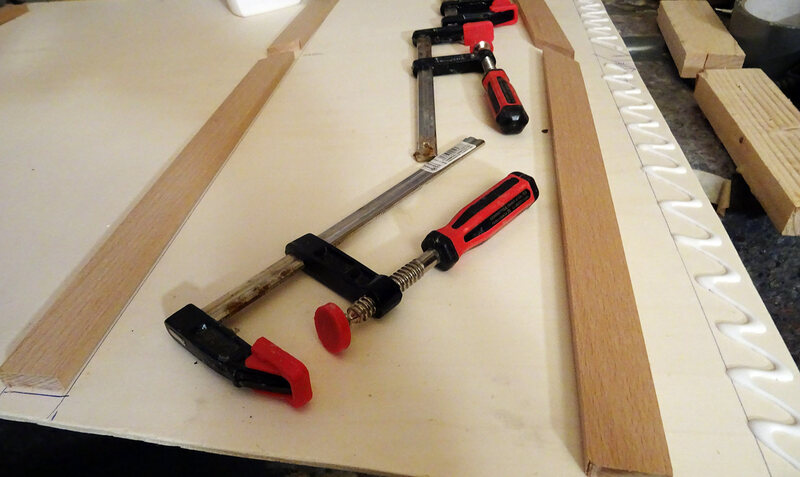 There are clamps available by which the wire is nailed or screwed to the surface, but that wasn´t a probable choice here as the plywood sheets are too soft and too thin. I opted for flexible plastic tubes in the end. Fixed cable ducts, glued with Epoxy to the panel. 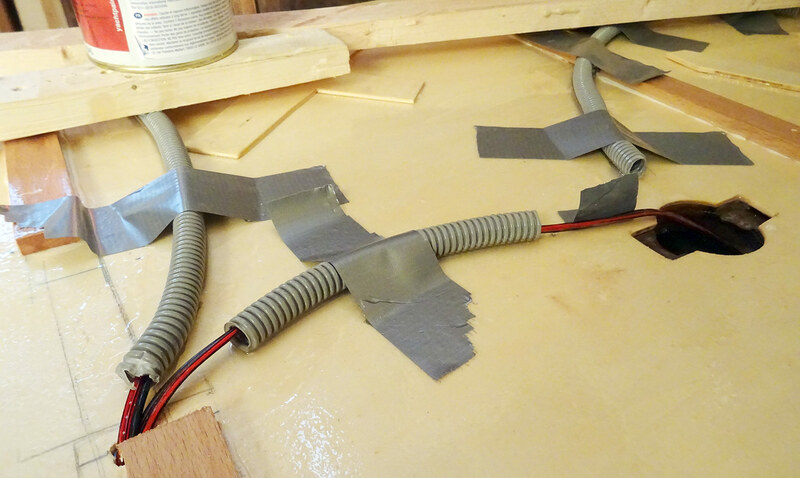 I don´t need to cover all of the cable as I just want to preserve them from chafing, so I began to glue the cable ducts to the panels by Epoxy as well, jury-rigging a fixation with Gaffer-tape and weighing some stuff on them. In a second leg I´ll strengthen the Epoxy-connection and I guess that will perfectly do. This is a very crucial step because if I fail to make it right it will be a major hassle later in the process to get a new wire through it or – worst case – take panels off, which I haven´t planned to do in the years to come. So that´s the current state of the works here. Now the panels are drying, the last plinths have been assembled and during the coming weeks I am going to get the cables onto the panels completely. Then it will be fixing, probably another series of cutting away surplus millimetres, priming, screwing and finally bringing together all the pieces of the new saloon´s roofing. In the third part of this series (here´s another to the first part) you will see how I fix the panels to the roofing substruction and begin decorative works to make them look like the role models in which I fell in love in the first place. Stay interested. Black Hole Yacht Refit? An interview with a Crew who made it. 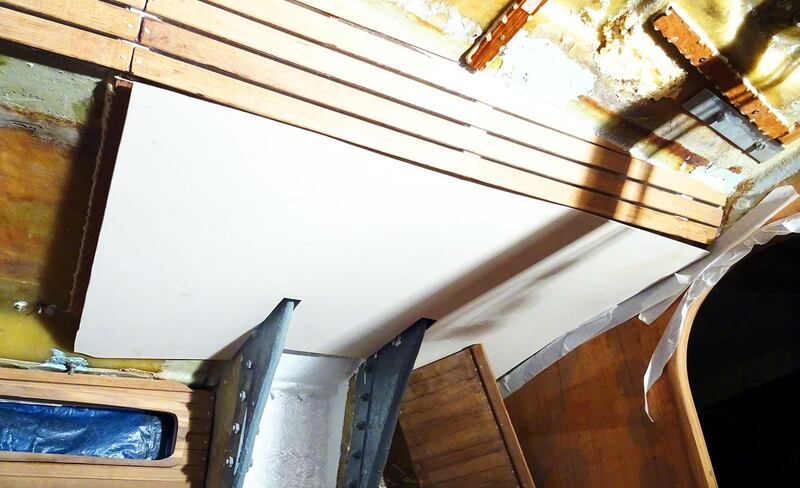 Refit of a nasty, filthy Bilge. Many thanks for your diverse range of topics discussed on your nfs site. many thanks, your comment is appreciated. I am always looking forward to talk to the designers as the process of turning imagination into reality is probably the most diverse and interesting human aspect: Connected with ships (whcih I love to talk about), it´s just pure joy.